'Disease Detectives' From CDC Help Find The Cause Of Mystery Outbreaks : Goats and Soda It all started with a funeral in Liberia. Guests fell ill but no one knew why. Time to summon the "disease detectives." When A Mystery Outbreak Strikes, Who You Gonna Call? This bacterium is the cause of the mystery illness in Liberia. We don't want to give it away ... so you'll have to read the story to find out what it is. Something happened at the funeral. Something was making people incredibly sick. And local health workers had no idea what it was. In April 2017 about 150 people had gathered for the funeral of a Christian minister in the small port city of Greenville, Liberia, in West Africa. The memorial spanned April 21 and 22 and included a wake that extended late into the night of the first day. Just one day after the minister was buried, 10 people arrived at the local hospital violently sick. Most of them were vomiting and had severe stomach cramps. Some had diarrhea as well. A few ran a fever, but most did not. The symptoms came on rapidly. But it was unclear what the patients were suffering from. What was clear was that it could be lethal. "These cases showed up at a hospital and a good amount of them were either dead on arrival or had a severe manifestation of a disease," says Jaymin Patel, an epidemiologist with the U.S. Centers for Disease Control and Prevention. Ten of the funeral attendees were admitted to the F.J. Grante Hospital, the only hospital in Greenville. All were in critical condition. Within hours five had died. The rest were moved to isolation wards. "The level of concern was very high," says Patel, who investigated the outbreak for the CDC's Epidemic Intelligence Service. Patel is an epidemic intelligence officer, also known as one the CDC's "disease detectives." Rumors quickly started to spread. "A lot of people were thinking, is Ebola back?" says Patel. During the 2014-2015 Ebola outbreak, nearly 5,000 Liberians died. To check for Ebola among the funeral attendees in Greenville, blood and saliva samples were rushed to the government's lab in Monrovia, says Tolbert Nyenswah, the director general of the National Public Health Institute of Liberia. The result: "We were able to immediately rule out Ebola," he says. "Within 24 hours we were able to allay the fears of the population. This was not Ebola that we were dealing with." That kind of rapid screening was something that just a few years ago, before the Ebola outbreak, Liberia didn't have the ability to do on its own. So it wasn't Ebola. But what was it? Nyenswah and other health officials still didn't know what was sickening the members of the funeral party. They didn't know whether the illness was continuing to spread or even exactly how to treat it. The Liberian Ministry of Health asked the CDC — and its disease detectives — for help. There was one undeniable fact, says Patel: Everyone who was sick was connected to the funeral. With Ebola checked off from the list of suspects, Patel says, there were still a lot of possibilities. "People then thought maybe it is a noninfectious cause like toxic poisoning or something that was consumed," he says. So health officials in Liberia sent vials of blood, urine and saliva from several of the patients to CDC headquarters in Atlanta. Patel's colleagues screened the samples for heavy metals and even insecticide. The tests turned up nothing. In Liberia concern about the mystery disease continued to grow. More people were being hospitalized with similar symptoms — and not just in Greenville. After the toxicity tests failed to turn up anything, the samples were sent to another lab at CDC headquarters. "They were tested simultaneously for over 40 infectious different agents," Patel says. Basically the technicians at the CDC lab were testing for everything they could think of. And finally they found an answer — but it was a surprising one. 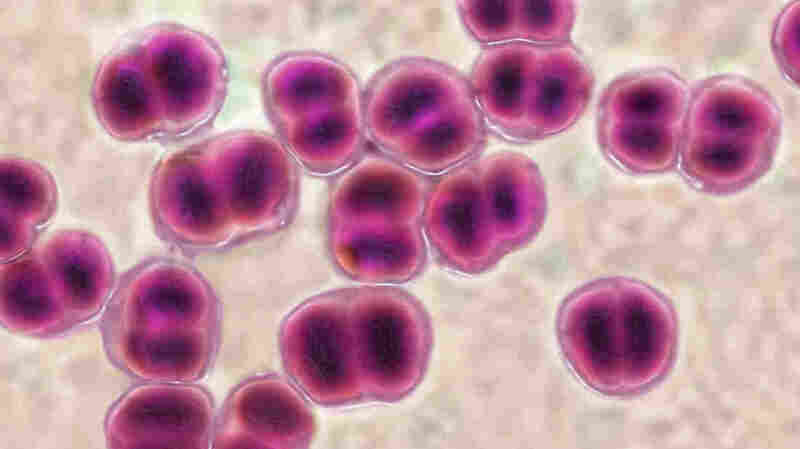 The samples were testing positive for Neisseria meningitidis, which can be spread by saliva or spit through close contact, like coughing or kissing. These were bacterial meningococcal infections — a condition that Liberian health care workers rarely see. Liberia sits on the coast and is officially outside the African meningitis belt that wraps across the continent below the Sahara. Most Liberians are not vaccinated against meningitis, although the meningitis vaccine commonly used farther north in the continent wouldn't have worked against this strain of bacterium anyway. And on top of all that, the bacterium was causing a blood infection that was difficult to diagnose instead of the classic meningitis symptoms of swelling around the brain. "[Neisseria meningitidis] would have been difficult to detect because our lab didn't have the capacity to do that," says Nyenswah. "So CDC coming in was very helpful. The lesson learned from this is that we increased the capacity of our labs to test for all types of meningitis. So now we have that capacity in our lab." In the end 31 people fell sick, and 13 died. Nyenswah says the CDC's assistance on the case allowed Liberian health care workers to effectively manage the outbreak — treat patients, safely bury the dead and reassure the community that the bacterium was unlikely to spread much farther. Nyenswah says both Ebola and this latest meningitis outbreak have pushed the Liberian Ministry of Health to upgrade its labs and how it attacks new disease outbreaks. "Before Ebola it was taking 90 days to detect diseases or even get a specimen to the lab," Nyenswah says. "Now it's taking 24 to 48 hours to do similar work." More analysis by technicians at the CDC of the bacterium that hit the funeral found that the bacterium was related to strains currently circulating in Niger and Nigeria. But how it got to Liberia remains a mystery. The CDC's disease detective program, the Epidemic Intelligence Service, is a two-year postgraduate training program — sort of a rapid response force of disease geeks. In addition to working on the early stages of the investigation from Atlanta, Patel flew to Liberia to help map the spread of the disease and write a report on the outbreak. The EIS program started in 1951, "at a time when there was a need for people to be able to investigate acute public health events," says Eric Pevzner, who runs the program at the CDC. The original idea was to bring in physicians, scientists, veterinarians, nurses and other health professionals and give them training in applied epidemiology. "So they then can go out to state and local health departments or overseas to ministries of health to try and answer critical public health questions," he says, "and at a moment's notice respond to emerging public health threats." Last year, EIS officer Caitlin Cossaboom was sent to Namibia to investigate a massive die-off of hippos and Cape buffalo that turned out to be caused by anthrax. Clothed head to toe in protective gear, Cossaboom had to gather blood and tissue samples from the bloated, rotting hippo carcasses. "Words cannot describe the smell," Cossaboom says with a laugh. She brought with her a new rapid diagnostic machine for anthrax that was able to test for the deadly bacterium out in the field. The machine had been developed originally to screen people after a potential bioterrorism attack. "You can run it bedside and get the results in 15 minutes," she says. "It's cheap and easy to use. But then our lab at CDC started thinking that this had possibilities for use in animals because we know that the most common route of anthrax transmission to humans is their animals." Cossaboom says one of the big fears in the Namibia outbreak was that anthrax would spill over from the wildlife into local livestock. "There are a lot of cattle and goats in the area, and they are very susceptible." In addition to testing dead hippo carcasses, Cossaboom worked closely with the Namibian Ministry of Agriculture to vaccinate livestock in the infected area. Other CDC disease detectives last year sleuthed out the cause of food poisoning at a chili and chowder cookoff in Virginia. It was salmonella in Chowder A. They tested cooling systems in New York City for Legionnaires' disease. They figured out that a group of people who had fallen ill in Arizona had Rocky Mountain spotted fever. And one of them determined that camel salesmen in the United Arab Emirates are exposed to the MERS virus at an incredibly high rate. "There's definitely no shortage of work for us," says Pevzner. "Many local health departments don't have the resources to prevent illnesses like cardiovascular disease, diabetes and cancers that are a major public health burden in the United States. And then we have things like the emerging threats. We had Ebola in West Africa. We had Zika in many parts of the world. And so it's the constant challenge of being able to focus on the ongoing public health challenges we face and the emerging threats." Who knows, maybe Pevzner and the disease detectives will inspire a spinoff of CSI — "DSI: Disease Scene Investigation." In a previous version of this story, several references to Eric Pevzner's last name were misspelled as Pezvner.